A gripping crime thriller that will have you hooked! First in a gripping new thriller series featuring investigative journalist Oonagh O'Neil. Perfect for fans of Susie Steiner, Patricia Gibney and Broadchurch. DI Alec Davies is appointed to investigate the priest's death. He and Oonagh go way back. But now they're united in uncovering not only what happened to the lost babies secretly born in the Institution, but what happened to the young women that survived by vowing loyalty to one another... forever. This book was previously published as Penance. 'I could hardly read fast enough!' Ourbookreviewsonline.blogspot.co.uk. 'In Oonagh O'Neil, the author has created a fascinating, flesh and blood character. Someone who pops from the page and someone, dare I say it, who would be great fun to go for a drink with' Crimesquad.com. 'Theresa Talbot does not shirk away from confronting the unsettling subject matter and [this] is a compelling story as a result' www.grabthisbook.net. 'A good mystery with many unexpected twists ... It keeps you turning pages the whole time' Cynthia Moskal, NetGalley. 'Too often I've read "thrillers" that didn't really thrill. This book has it all, plenty of story line and plenty of detail' Margaret Leonard, NetGalley. 'A must-read for anyone who loves detective crime thrillers based loosely on true events' Linda Tilling, NetGalley. 'I really loved this book! 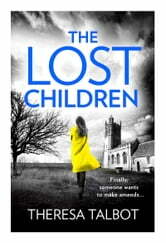 Excellent story with brilliant main characters' Stephanie Collins, NetGalley. 'A clever and well-written novel based on harrowing true experiences' Donna Bradley, NetGalley. 'A very good read and I would certainly recommend it' Mary Picken, NetGalley. A tale of innocence lost, guilt and penance. The Lost Children is a book that thrilled with its mystery and made me feel more than a little sad about the abuse. The writing was succinct and the dialect added a certain effect to bring the world of Glasgow alive in its pages. What The Lost Children does do in great effect is shine light on the world of all those who've suffered at the hands of the society, the religion and the people whom they believed and trusted. The inhumane things done in the name of religion. Probably not the first thing you think about when you choose a mystery book. Yet that’s what #TheLostChildren is about. It’s written by #TheresaTalbot an author I have never heard about but definitely have now put her at the top of my favorite author list. This book is so well written and the subject is handled in such a manner that you don’t hate it even if you are a Catholic which I am but you embrace it and hopefully learn from it. I was totally surprised when I saw that one reviewer had only given this a 2 star rating. It has been a long time since I have across a book of this magnitude and I without any reservations give it the five stars it so richly deserves. I thank #NetGalley and especially Theresa Talbot for giving me the chance of reviewing this book. The subject matter is how unwed mothers get put in homes run by the Catholic Church and the babies then either placed in homes or actually sold. The mothers who in the reality are very young children without too much education are then pretty much put into slavery to help the nuns who run the homes. Eventually as all things do this practice comes to an end when it gets discovered by the outside. The book switches between 1958 and 2000 and is being told by a reporter Oonagh O’Neil and Irene Connolly one of the mothers. I don’t want to get into details about the plot because it nee no explanation. This is a very well written book about a troubled time in history. I totally recommend it. When Oonagh O'Neil starts digging into the Magdalene houses, she had no clue that she were stirring more than just the average hornets net. This book kept me guessing until the end.